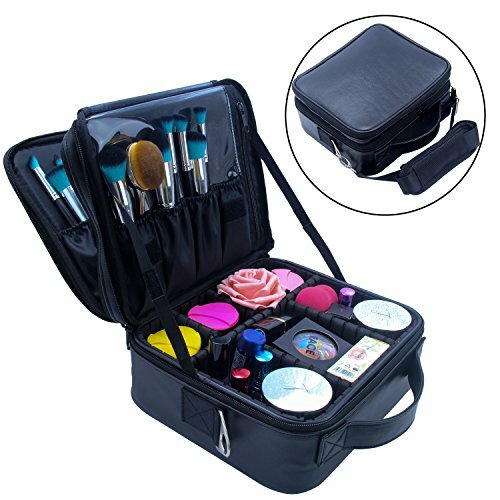 A great professional makeup case, perfect for makeup artist or beginner. Fine workmanship and high quality material. Size: 10.3" L x 4.7" W x 9" H.
-Durable Makeup Case, Made of high quality PU leather and Lining-nylon, waterproof and shockproof. -With two-way zipper and wide handle, make it more convenient and safe to take. -Has 2 specific layer, first layer: 3 large elastic pockets and 1 large mesh zipper compartment. second layer: with serveral elastic makeup brush slots and a mirror. -With Mirror and supporting belt on both side add your convenience in everyday use. -Keep everything neat and tidy, This makeup case have several compartments and makeup brushes slots, you can keep your makeup and makeup brushes are neat and tidy. Premium Material: This Makeup Bag is made of high quality PU leather, Lining-nylon. with litchi pattern surface, very simple and stylish. (Note: Cosmetic Accessories Not included). Attentive Designed More Convenient Than Other Train Case: This makeup bag design with Mirror and supporting belt on both side add your convenience in everyday use. Adjustable straps let you use it as should bag or a backpack. Adjustable Dividers: This Makeup Bag have several compartments and makeup brushes slots, you can keep your makeup tools is neat and tidy. Special design adjustable compartments, you can adjust as needed. Roomy And Multi Compartment: This professional makeup bag has 2 specific layer, First layer: 3 large elastic pockets and 1 large mesh zipper compartment. Second layer: with serveral elastic makeup brush slots and a mirror. Multi Functional Makeup Artist Box Perfect for Any Occasions: It can be used as Personal makeup case organizer , professional makeup artist box,as handbag with a belt to carry on the shoulder. Not only can storage your cosmetics, but also Jewelry, Electronic Accessories, Camera, Essential oil, Toiletries, Shaving Kit, Valuable objects and so on.